Crutches are often used to minimize pressure and weight on an injured leg. They are a common assistive device used after injury or surgery. Your physical therapist can teach you how to properly size your crutches. Before using crutches, it is important to be instructed by a healthcare professional as to how to properly use them. This should include proper crutch positioning and sizing. Being adequately fitted with a pair of crutches is important for safe crutch use as well as to prevent possible nerve damage in your arms or hands. The top of your crutches should be between one to 1 and 1/2 inches below your armpits while standing up straight. The handgrips of the crutches should be even with the top of your hips. There should be a slight bend in your elbows when you use the handgrips. Hold the top of the crutches against your sides, and use your hands to absorb the weight. Do not press the top of the crutches into your armpits. This could result in damage to the nerves that run under your arms. Following these tips should help ensure proper crutch sizing, which can make using your crutches simple. If your crutches are too high, they may make it difficult to walk; you'll feel like you are pole vaulting over the crutches with every step you take. If your crutches are too short, it may cause you to lean forward too far, leading to back pain, shoulder pain, or neck pain. Remember that everyone is different, and your crutch sizing may take a bit of finessing to get it absolutely right. Your physical therapist can help you make sure your crutches are the proper height and that you are using them correctly for your condition. A solid crutch training session will focus on proper walking and weight bearing, practicing walking up and down stairs and walking up and over curbs and obstacles. Your physical therapist can ensure that you are safe while training on your crutches. Some doctors recommend you learn to walk on crutches before an elective lower extremity surgery. Remember, there are different levels of weight bearing and different types of gait patterns that may be used with your crutches. By learning these types of crutch walking patterns, you can be sure to remain safe while walking with your crutches. When walking with only one crutch, you should not need to make any changes to the crutch size or position. Typical progression from walking with crutches would be to walk with two crutches, one crutch, and then progress to walking with a cane. When using one crutch, it is often used on the opposite side of your injury or weakness. 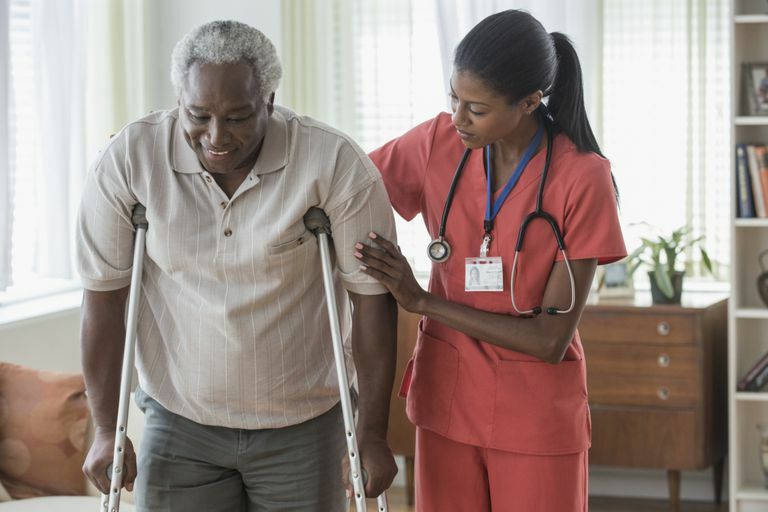 If you are required to walk with crutches after an injury or surgery to your lower extremity, take the time to visit your physical therapist and doctor to be sure your crutches are sized properly. Doing so can make walking safe and effortless and help you on your road to full recovery to your normal lifestyle. American Society of Orthopaedic Surgeons. How To Use Crutches, Canes, and Walkers. July 2007. Crutches.